The temple mount is the place where the Biblical temples were built, starting from King Solomon almost 3,000 years ago. Herod's temple was destroyed by the Romans and never rebuilt again by the Jews. It was replaced by the Muslim shrines in the 8th C AD which stand there today, with the Golden Dome of the Rock - the city's symbol. 1 Kings 2: 10: "So David dwelt in the fort, and called it the city of David. And David built round about from Millo and inward. And David went on, and grew great, and the LORD God of hosts was with him". The temple mount is the place where the Biblical temples were built, starting from King Solomon almost 3,000 years ago. The temple was built in 3 phases (Solomon, Zerubbabel, and Herod) and was destroyed by the Romans. The temple was never rebuilt again by the Jews, and replaced by the Muslim shrines in the 8th C AD which stand there today over the ruins of the base of the Roman period temple. This is an overview page, which refers to additional pages with more photos and information on the temple mount sites. The temple mount is packed with dozens of structures, special sites and hundreds of stories spanning thousands of years, and we try to present a fraction of them and accompany the information with dozens of photos and illustrations. The temple mount is located in the walled city of Jerusalem, on the eastern side of the old city. There are two tourist entrances, but the entrance is often limited to hours between the prayers. The first temple was built by King Solomon at about 950 BC, and was located on the highest point above the Kidron valley - on mount Moriah. As per the Bible (2 Chronicles 3:1: "Then Solomon began to build the house of the LORD at Jerusalem in mount Moriah, where the Lord appeared unto David his father, in the place that David had prepared in the threshingfloor of Ornan the Jebusite". The temple was destroyed after the intrusion of Babylonian Nebuchadnezzar II (as per Jeremiah 34: 7): "When the king of Babylon's army fought against Jerusalem". He destroyed Jerusalem in 587BC (2 Kings 24: 10,13): "At that time the servants of Nebuchadnezzar king of Babylon came up against Jerusalem, and the city was besieged....And he carried out thence all the treasures of the house of the LORD, and the treasures of the king's house, and cut in pieces all the vessels of gold which Solomon king of Israel had made in the temple of the LORD, as the LORD had said" . 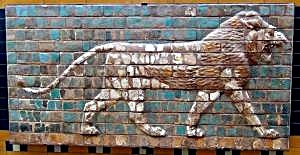 The population was transferred to Babylon, but returned after 50 years. After their return, on 536, Zerubbabel built the first phase of the second temple. (Ezra 3: 8: "Now in the second year of their coming unto the house of God at Jerusalem, in the second month, began Zerubbabel ... to set forward the work of the house of the LORD"). Over 500 years the temple was repaired and new walls were constructed, but the major overhaul was performed by Herod - the great builder. Herod the Great, King of Israel under the Romans (37BC - 4BC), enlarged and rebuilt the second temple, and made it a magnificent temple. A reconstruction of the temple is illustrated below, with a view from the south-east. The trapezoid area of the temple mount was 144,000 square meters - the size of about 20 football fields. Its wall lengths were 280m (south wall), 460 (east wall), 315 (north wall) and 485 (west wall). The mount was 10 stories high - its height above the street level was 30m with additional 20m underground, using heavy hewn boulders measuring between 2-5 tons (small size) to 10 tons and more. Indeed - a colossal enterprise designed to host more than 100,000 visitors during the holidays. One of the exciting findings belonging to the Herodian temple was found by Clermont Ganneau in 1871 in a graveyard near the temple mount wall. 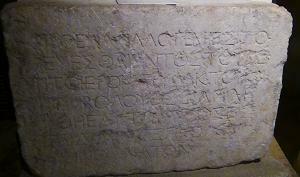 This 1st C AD warning stone reads (in Greek): "No intruder is allowed in the courtyard and within the wall surrounding the temple. Whoever enters will invite death for himself". This warning is based on the Bible (Numbers 1:51): "And when the tabernacle setteth forward, the Levites shall take it down: and when the tabernacle is to be pitched, the Levites shall set it up: and the stranger that cometh nigh shall be put to death". Following the Jewish revolt against the Romans, the Roman troops headed by Titus destroyed and looted the city and the temple. This left most of Herod's second temple in rubble. Only few remnants of this remarkable structure remained, such as the western wall, Hulda Gates, and the south-western corner in the southern wall. The temple mount was left in ruins. 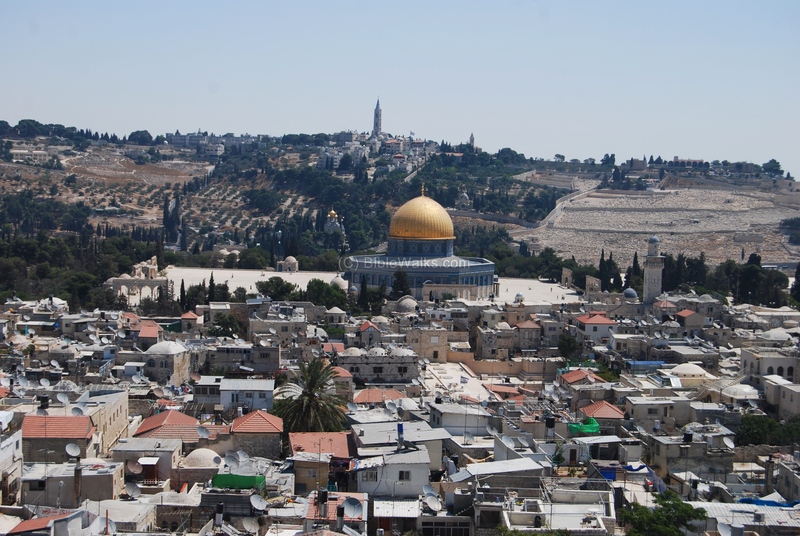 The Romans rebuilt the city and laid out new roads, while the temple mount was left in ruins. A large church was built in the 6th C AD in the area of El-Aqsa mosque. The Arabs conquered Jerusalem in 638AD, and Khalif Omar visited and prayed in the site in that year. The dome of the Rock shrine, with the large golden dome and an octagon structure, was built by the Umayyad Khalif Abdul-Malik ibn Marwan in 691 (72 year according to Muslim calendar), and named it after Omar. It is one of the most beautiful and enduring shrines in the World, and remained almost untouched throughout the years. The rock is, according to Muslim tradition, the spot where prophet Mohamed ascended to heaven. Years later, either in 696 (by the same Khalif) or in 705AD (by his son), another dome was built on the far south side: the Al-Aqsa mosque (also "Al-Aksa", which means "the remote" mosque). It was named after the tradition of prophet Muhammad's imaginative travel from Mecca to a remote mosque. Additional Umayyad palaces and administration structures were constructed south of the temple mount. In 1099 the Crusaders called the Temple mount as "Templum Domini", turned the Dome of the rock to a church, adding a cross on the dome. They turned the Al-Aksa mosque to a prayer house and then to Baldwin's royal palace in 1104, naming it King Solomon's palace. The Templar Knights military-religious organization was established in 1118, and named their organization after the temple. The vast halls under Al-Aksa mosque was believed to be King Solomon's stables, a name still used today in the area that the was cleared under the mosque. During the 14th-20th C the temple mount became a major Muslim prayer site; new walls and gates were constructed around the temple mount and the city; dozens of shrines, prayer domes and fountains added in the temple mount. In 1967 Israel reunited Jerusalem, but left the control of the temple mount to the Muslim Wakf. From time to time there are religious and political frictions ignited at the site, for example the riots in year 2000 that sparked the 5-years Palestinian uprising, called the "Al-Aksa Intefada". The situation seems explosive almost periodically, and the Israeli police staffs thousands of policemen in some Fridays, limiting the age and residence of the allowed persons to enter the temple mount in order to reduce the friction. There are some extreme Jewish groups who want to rebuild the "third temple", but this is a small group which is limited by the authorities. In addition, there are political debates over the fate of the city, which spells out more trouble in this hot spot. The plan of the temple mount, as it is today, is illustrated in the following diagram. The Dome of the Rock is located in the center of the Area, while the Al-Aqsa mosque is on the south (bottom) side. You can point & click on most of the highlighted sites to navigate to that point. One of the best views of the temple mount can be seen best from the bell tower of the Redeemer church, near the Holy Sepulcher. The golden Dome of the Rock is in the center. Behind it is Mount of Olives. 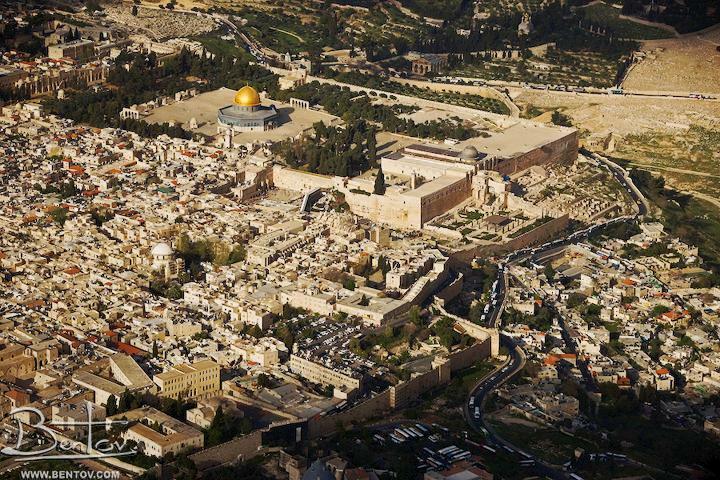 The following photo shows an aerial view of the the temple mount area, as seen from the south-west side. The Dome of the Rock, an octagon structure with the Golden dome, is seen in the upper middle of the photo. Al-Aksa silver dome mosque is seen on the right side of the raised temple mount, which is adjacent to the southern wall. On the west side of Al-Aqsa mosque is the Islamic Museum. Just above the walls, between the two mosques, is the Western wall. On the east side (left of the photo) is the Kidron valley, and beyond it is Mount of Olives. 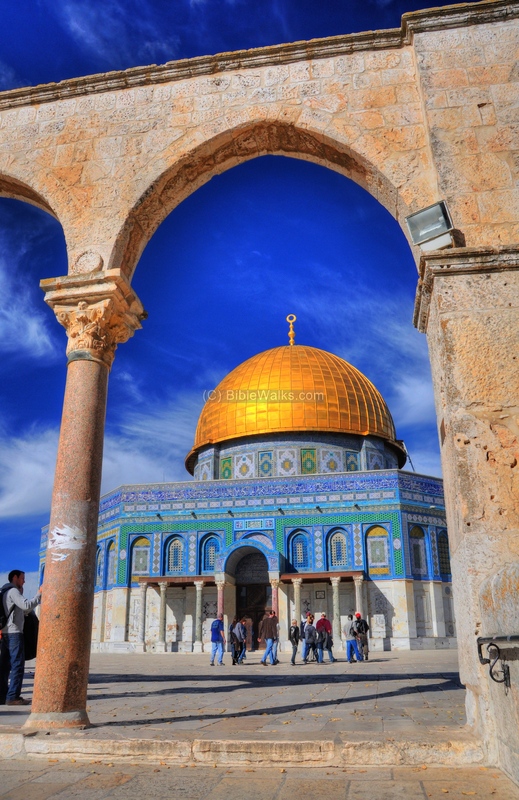 The shrine of the dome of the Rock, with its large golden dome and an octagon structure, was built in 696Ad. It is one of the most beautiful and enduring shrines in the World, and remained almost untouched throughout the years. The rock is, according to Muslim tradition, the spot where prophet Mohamed ascended to heaven. The shrine is located in the center of a raised platform which itself is in the center of the temple mount. A view of the gateway from Al-Aqsa mosque to the Dome of the Rock is seen in the following picture. This arched entranceway is one of the eight around the raised platform. For more information on the Dome of the Rock - see a separate web page. The Al-Aqsa mosque is located on the southeast side of the temple mount. Its silver dome towers over the southern wall. On the left side of the wall is a base of the "Robinson" arch, was part of the Herodian 1st C temple. For more information on Al-Aqsa mosque - see a separate web page. 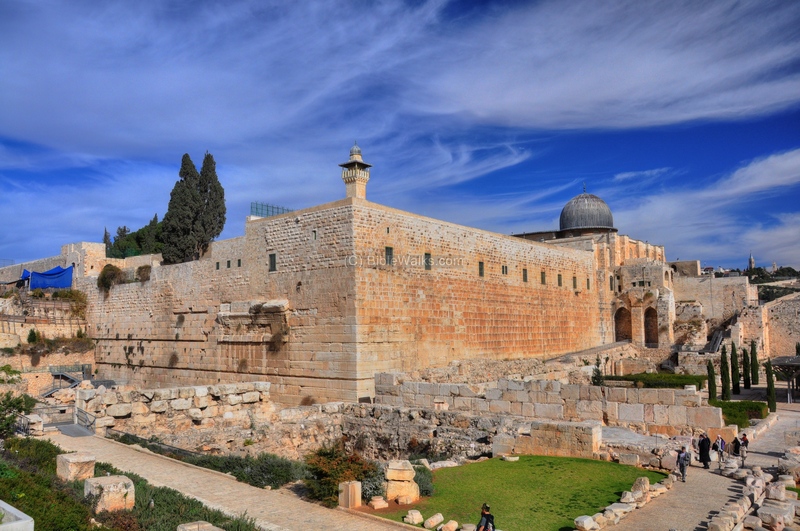 In addition to the Al-Aqsa mosque and the Dome of the Rock are additional sites around the walls of the temple mount. A view from the north side is seen below. This was taken from the the Al-Omariya school, near station 1 of Via Dolorosa. 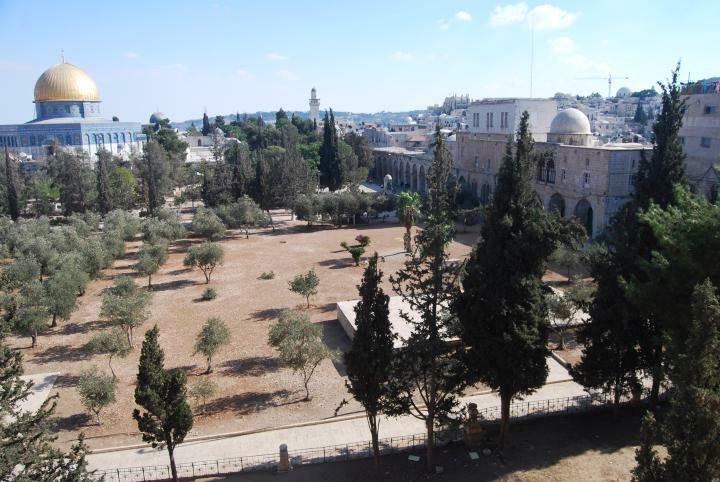 About one third of the area of the temple mount, which covers a total area of 48 dunams (11.87 acres), is planted with trees. In the center of the temple mount is a raised platform where the shrine of the golden dome of the rock stands. Other domes, water fountains, gates, minarets and other structures are located around the peripheral walls. For more information on additional sites on the temple mount - see a separate web page. (e) Where were the 1st & 2nd temples located? The Roman destruction of the temple and the reconstruction by the Muslims and Crusaders wiped out the location of Herod's 2nd temple and its older Biblical predecessor. Their exact location is a mystery that haunted the scholars and the faithful for centuries. There are many speculations on the location of the ancient temples. A summary of some of the theories may be found in Tuvia Sagiv's article. The quest for the location of the gates and bridges of Herod's temple is also summarized in our special featured web page. For more information on the lost gates - check the page of the Second temple gates. "So David dwelt in the fort, and called it the city of David. And David built round about from Millo and inward. Josephus, the Commander of the Jewish revolt against the Romans, and later a historian of the period. He writes about the construction of the 2nd temple by Herod, which expanded the previous temple of the returnees. Note that cubit unit is about 44cm. "So Herod took away the old foundation, and laid others, and erected the temple upon them, being in length a hundred cubits, and in height twenty additional cubits, of which [twenty], upon the sinking of their foundations fell down; and this part it was that we resolved to raise again in the days of Nero. 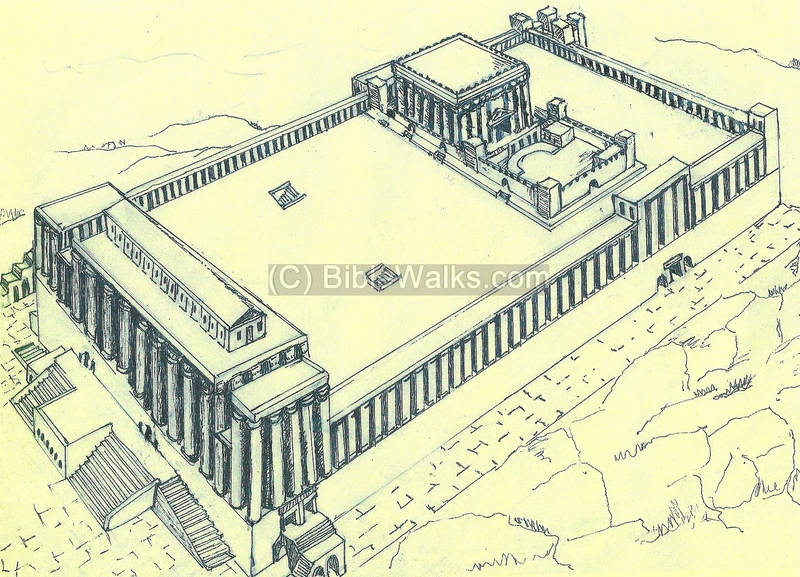 Now the temple was built of stones that were white and strong, and each of their length was twenty-five cubits, their height was eight, and their breadth about twelve; Now in the western quarters of the enclosure of the temple there were four gates; the first led to the king's palace, and went to a passage over the intermediate valley; two more led to the suburbs of the city; and the last led to the other city, where the road descended down into the valley by a great number of steps, and from there up again by the ascent for the city lay near to the temple in the manner of a theater, and was encompassed with a deep valley along the entire south quarter; but the fourth front of the temple, which was southward, had indeed itself gates in its middle, as also it had the royal cloisters, with three walks, which reached in length from the east valley to that on the west, for it was impossible it should reach any farther: and this cloister deserves to be mentioned better than any other under the sun; for while the valley was very deep, and its bottom could not be seen, if you looked from above into the depth, this further vastly high elevation of the cloister stood upon that height, insomuch that if anyone looked down from the top of the battlements, or down both those altitudes, he would be giddy, while his sight could not reach to such an immense depth. This cloister had pillars that stood in four rows one near to the other all along, for the fourth row was interwoven into the wall, which [also was built of stone]; and the thickness of each pillar was such, that three men might, with their arms extended, fathom it round, and join their hands again, while its length was twenty-seven feet, with a double spiral at it basis; and the number of all the pillars [in that court] was a hundred and sixty-two. Their chapiters were made with sculptures after Corinthian order, and caused and amazement [to the spectators], by reasons of the grandeur of the whole. These four rows of pillars included three intervals for walking in the middle of this cloister; two of which walks were made parallel to each other, and were contrived after the same manner; the breadth of each of them was thirty feet, the length was a furlong, and height fifty feet; but the breadth of the middle part of the cloister was one and a half of the other, and the height was double, for it was much higher than those on each side; but the roofs were adorned with deep sculptures in wood, representing many sorts of figures. The middle was much higher than the rest, and the wall of the front was adorned with beams, resting upon pillars, that were interwoven into it, and that front was all of polished stone, insomuch that its fineness, to such as had not seen it, was incredible, and to such as had seen it, was greatly amazing". Har Habayit - Hebrew: Har=Mountain, Bayit=House - The mountain of The House. Al-Aqsa (Al-Aksa) - In Arabic: the "remote" or the "farthest". The silver dome is built on the southeast side of the temple mount, and is named after the Muslim's account of the imaginative night travel of prophet Muhammad to the remote mosque. This mosque is detailed in another web page. Kubat es-Sakhra - In Arabic: the dome of the Rock. The name dome was derived from its golden Dome, and "Rock" is named after the "foundation rock". The rock is in the center of the shrine, and according to Jewish tradition was the place where Abraham came to sacrifice his son Isaac. The rock is the center - (foundation) of the world. According to Muslim tradition, prophet Muhammad ascended to the heaven from this rock. This shrine is detailed in another web page. Shtiya - Hebrew: foundation (this is based on the root word sh-at-at, which the word "Tashtit" is derived, meaning: foundation. Thanks Stav Lefler for the correction).